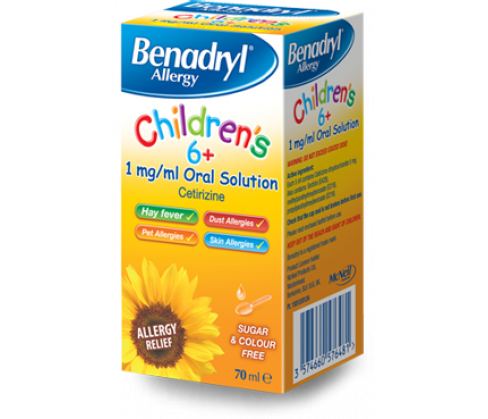 Benadryl Childrens 6+ Solution is indicated for the treatment of allergies and related symptoms in children aged six years and above. It is a sugar-free, banana flavoured formulation that effectively reduces symptoms of hay fever, urticaria, mould allergies, pet allergies, allergies from dust etc. The medication is not recommended for use in children below six years of age. Before use, read all instructions and labels thoroughly. Speak to a doctor if your child is allergic to any of the ingredients or you are unsure about something. Do not exceed the standard dose. Discontinue use and consult your doctor in case symptoms worsen or do not subside after three days of treatment. The formulation is for oral use only. The standard dose in adults and children above twelve years of age is 10ml (two 5ml spoonfuls) once daily. Children between six and twelve years of age should be given 5ml of the formulation two times in a day. You can give the medicine with or without food. Consult a doctor in case symptoms don?t improve or worsen despite using this medication regularly. 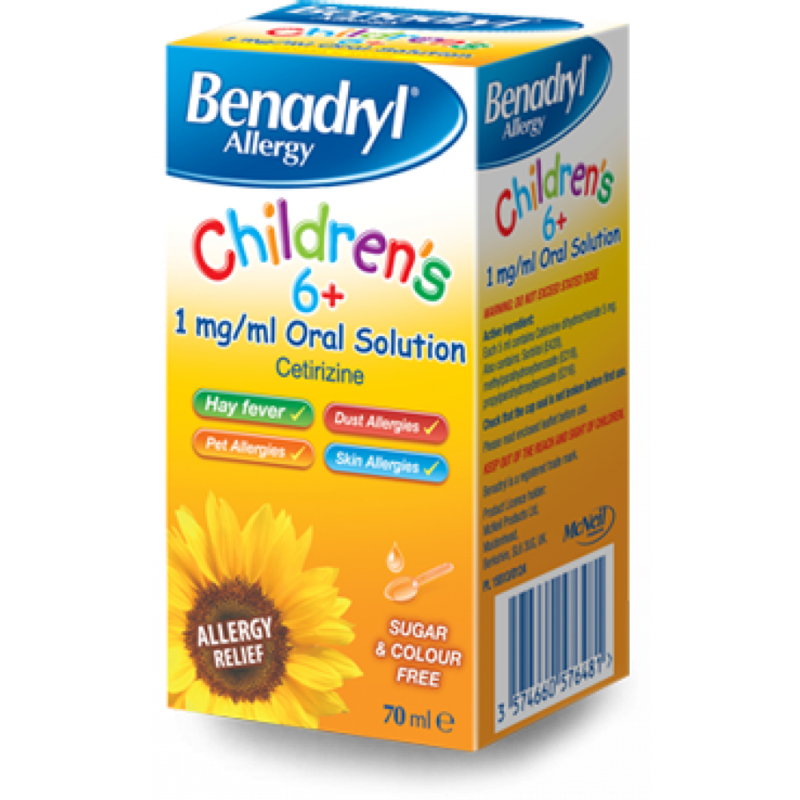 Each 5ml of Benadryl Childrens 6+ Solution contains Cetrizine Hydrochloride 5mg as the active ingredient. Also contains as excipients Sorbitol, Propyl Parahydroxybenzoate (E216), Methyl Parahydroxybenzoate (E218), Proplene Glycol, Glycerol, Sodium Acetate, Saccharin Sodium, Acetic Acid , Banana Flavouring and Purified Water.